At three, Juana Ines de la Cruz, feisty Mexican girl with the sustaining passion for knowledge, persuaded an older sister to teach her to read and write. Juana devoured the books she found in her grandfather’s study: literature, science, philosophy, theology, languages. She developed some quirky habits. “I would abstain from eating cheese because I heard tell that it made people stupid,” Juana reports, “and the desire to learn was stronger for me than the desire to eat.” Whenever she was dissatisfied with her mastery of a certain subject, she’d cut off her hair to punish her own dull-wittedness. A head that was bare of facts should also be bare of pretty curls. The era was seventeenth-century Mexico. The authorities were male, traditional Catholic, Spanish colonialists. And the young scholar? She was the daughter of unwed parents, a Spanish military officer and a Mexican-born mother, a girl from the town of Nepantla, Aztec for “land in the middle.” As an illegitimate child, her birth was not even recorded in the church registry. Her very existence was off the books—but not for long. 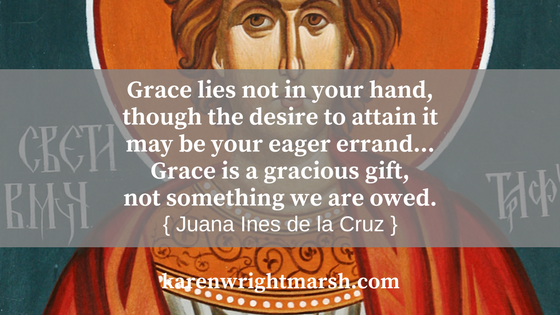 Juana Ines de la Cruz's passion and faith took her far. To this day she's known as the first female theologian in the Americas. A sinner-saint to love and admire.